1969 The 1969 Mustang Grande was only offered for the hardtop and included a vinyl roof, plush interior, deluxe two-spoke steering wheel, full wheel covers, color keyed racing mirrors, electric clock, bright exterior moldings, dual outside paint stripes (also missing on this car), and luxury foam bucket seats for an additional $231. 1970 The 1970 Mustang Grande option was only for the hardtop and consisted of a vinyl roof, plush interior with luxury foam bucket seats, deluxe two-spoke steering wheel, color-keyed racing mirrors (not on the car shown), full wheel covers, electric clock, bright exterior body moldings (only on the truck of this car), and dual outside paint stripes. 1971 The 1971 Mustang Grande option was only for the hardtop and consisted of a vinyl roof, plush interior with deluxe cloth high bucket seats, electric clock, interior trim panels with molded pull handles and arm rests, deluxe two-spoke steering wheel, color-keyed racing mirrors, full wheel covers, metal rocker panel moldings, metal wheel lip trim, and dual exterior paint stripes. 1972 The 1972 Mustang Grande was a special luxury package for the hardtop body style. The Grande options package included a full vinyl roof with Grande script lettering, body side tape pin stripes, full wheel covers, a Lambeth cloth and vinyl luxury seats, bright pedal pad trim, deluxe instrument panel trim with wood grain, and electric clock. 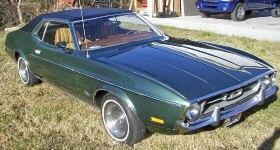 1973 The 1973 Mustang Grande was a special luxury package for the hardtop body style. The Grande options package included a full vinyl roof, body side tape pin stripes, full wheel covers, and a luxury seats and interior trim. This was the last year that the luxury options package was called Grande, in 1974 it was renamed the Ghia after a redesign of the options by the newly Ford acquired Ghia Italian design firm.